The National Day of Prayer is considered by many as a vital part of our national heritage and American tradition. In 1775, numerous U.S. founding fathers and the Continental Congress asked the colonies to pray for wisdom in forming a new nation and since that first call to prayer the tradition has continued through U.S. history, including President Lincoln’s proclamation of a day of “humiliation, fasting, and prayer” in 1863. The National Day of Prayer was created in 1952 by a joint resolution of the United States Congress and signed into law by President Harry S. Truman. Every President since 1952 has signed a National Day of Prayer proclamation. In 1988, the law was amended and signed by President Reagan, permanently setting the day as the first Thursday of every May. Each year, the president signs a proclamation, encouraging all Americans to pray on this day. Last year, all 50 state governors plus the governors of several U.S. territories signed similar proclamations. 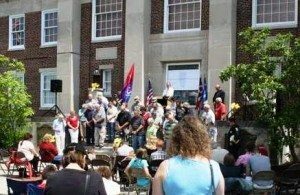 9 a.m. – Prayer service in front of the Milford City Building, 745 Center St.
Batavia. Eve Moody is the coordinator. 101 E. Main St. in Batavia. Hosted by Eastgate Community Church, Pastor Dale Campfield. Noon – Prayer service on the Clermont County Common Pleas Court House steps in Batavia. soloists and area pastors will pray for the country, county, community, children and military. Organized by the Clermont County National Day of Prayer Task Force. members. Vickie Hale is the coordinator. and hymns. All pastors and veterans will be recognized. Pastor John Martin is the coordinator. Community Christian Church, 125 E. Plane St. in Bethel.